A must for leaders, HR practitioners and recruiters! 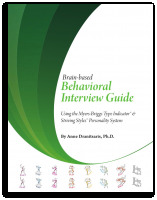 This essential guide provides you with the interview questions you need to really understand a candidate's brain organization based on the Striving Styles Personality System. No more guessing at selection. Use this guide to explore candidate's Striving Style Squad, whether they are self-protective or self-actualizing and implications for role performance. Get past a candidate's story to truly understand the capabilities and motivation they will bring to bear on your organization.